Despite your best care, teeth can develop cavities, cracks, and other problems. 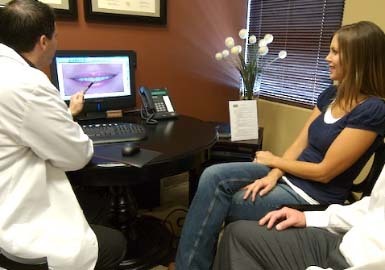 We can help fix trouble spots and rejuvenate your smile. Aesthetic restorations, like tooth colored fillings and porcelain crowns , give us the capability to craft solid, attractive restorations that will withstand the test of time. Early detection is the key to keeping your mouth healthy. That’s why it’s important to take care of your mouth and visit your dentist regularly. The signs may be subtle, but if you’re aware of them and treat them accordingly, you can help protect your mouth from developing broader oral health problems. Regular visits are recommended for the early detection of oral health problems which can be a sign of other health problems. Extremely Low Radiation Digital X-Rays. Full Mouth Digital Photograph Series.